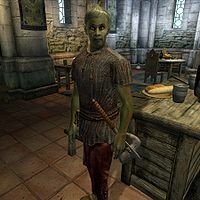 Delos Fandas is a Dunmer and the publican of The Feed Bag in the Market District of the Imperial City. He sells food and beverages. Notorious for mediocre cooking and cheap prices, The Feed Bag is often criticized when Market District inhabitants are asked for rumors. Regardless, the place is packed every night and as a result, proprietor Delos Fandas offers his services 24 hours a day and never even pauses to eat or sleep, despite the presence of a full-fledged bedroom on the second floor. The Feed Bag is evidently not providing much wealth for Delos. He wields an iron mace but can only afford a lower-class outfit of laced leather pants, a sack cloth shirt and a pair of clogs. He carries around the Feed Bag Key and a small amount of gold. When you approach him, he will give you his sales speech: "Put on The Feed Bag! I'm Delos Fandas. We got food and drink, and lots of it." When you ask him about his city of choice, he will explain that, "Look. It's big, see. REALLY big. Only way to learn it is to walk it. Look at everything, talk to everyone." Esta página foi modificada pela última vez à(s) 04h26min de 21 de março de 2015.